The “geeky” reputation of science, technology engineering and maths (Stem) subjects still endures in some UK schools, with many students finding them boring and abstract. But a teacher at an innovative schools group is hoping to turn such attitudes around, after travelling the globe to see some of the best teaching approaches first-hand. Phil Avery, director of learning and strategy at Bohunt Education Trust in Hampshire, visited schools in three countries that excel in Stem education: Sweden, the Netherlands and the US. Mr Avery, whose trust recently developed its own Stem curriculum with engineering companies including Siemens and Surrey Satellite Technology, hopes that his review of the trip will help British schools to inspire their pupils. In America, the first country he visited last year, he found extensive use of “Fab Labs” – workshops using computer-controlled tools to turn concepts into a physical reality (see picture below). 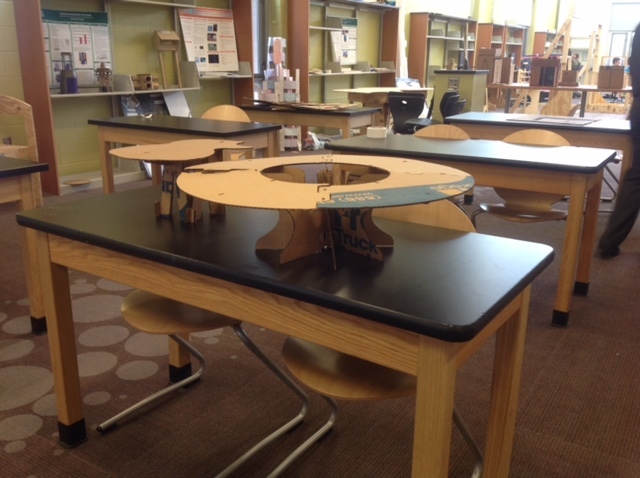 In an Ohio lab, pupils designed and built a circular computer table that would have cost $3,000 for only $300. He was also impressed by how companies and universities interacted with schoolchildren from an early age and did so through long-term partnerships rather than “one-off ‘inspiration’ events”, as often happens in England. “In Ohio, universities and businesses work in schools to accelerate interested students to apprenticeships and free degrees by the age of 18 and in doing so have reduced their staff turnover by 45 per cent,” said Mr Avery, whose trip was funded by the Winston Churchill Memorial Trust. Meanwhile in Sweden he found that the country’s huge petrochemical industry had taken an active role in inspiring pupils by bringing industrial kit into schools to pique curiosity. In the Netherlands, Mr Avery was impressed by the way many schools combined science and foreign language teaching through the “immersion language learning” approach he has already implemented at Bohunt School in Liphook. At Bohunt – which was TES school of the year in 2014 – pupils are taught a third of their timetable in Spanish, French or Mandarin. But the linking of subjects was done most creatively in the US, Mr Avery found. In a school in San Diego, California, a physics class would study a particular concept – electromagnetism, for example – which would then become the basis of a creative writing assignment in an English lesson. This was carried into art class where pupils would create a comic about a superhero whose power was based on the concept introduced in physics. Mr Avery said: “Pupils recap and re-engage with knowledge learned this way, rather than not returning to it until exam revision. Mr Avery will be writing up his full findings this summer.